Join us for the next #cdnmoney Twitter Chat to learn about couponing in Canada. 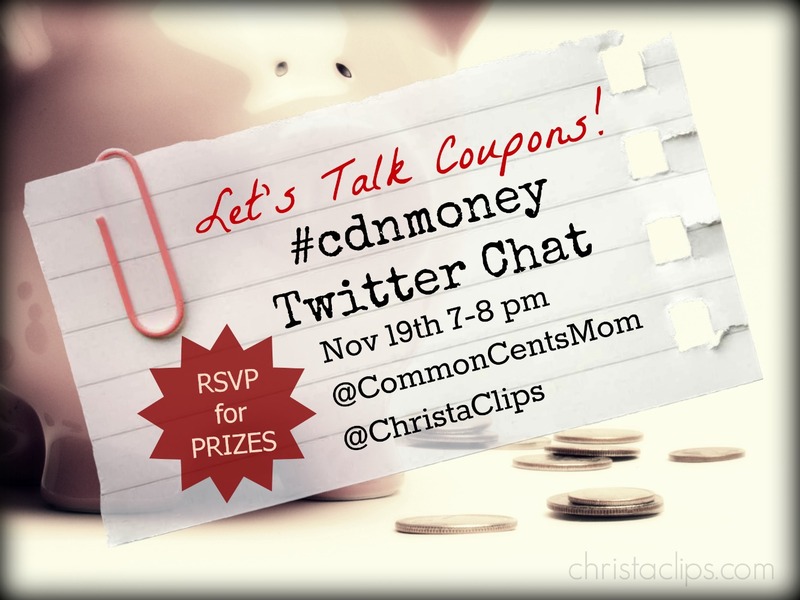 Follow your hosts @commomcentsmom @christaclips and tweet with the hasthag #cdnmoney – RSVP at christaclips.com to be eligible to win PRIZES! What are the best coupon apps? What does all that fine print mean? Can we really save money by couponing here in Canada? Have you ever seen coupons in Canada for ___________? Ask your couponing questions, share some of your savvy, and connect with other money mindful tweeps! engage by tweeting and RTing during the #cdnmoney chat – ask your questions about couponing and share your savvy savings tips! #cdnmoney twitter chats are open to an international audience, but only those residing in Canada with a valid Canadian mail address are eligible to win the prizes this week: they’re Canadian coupons and would be of little to no value to those residing in other countries. New participants are always welcome! New to #cdnmoney twitter chats? Common Cents Mom aka Hollie Pollard, is the host of the #cdnmoney money chat on Twitter each Tuesday evening and is considered one of the 75 most influential mom bloggers in Canada.She blogs about life and how to live it well on a budget (needless to say, I think she’s swell!). Check out Hollie’s post about “How to Participate in a Twitter Chat” and don’t hesitate to drop a line in the comments below if we can help get you all set-up to join us! We look forward to chatting with you about coupons at Tuesday’s #cdnmoney Twitter Chat! Christa is a Save-at-Home-Mom who writes about money saving tips with hopes of inspiring other families who might want to keep one parent at home but aren't sure they can swing it financially. Christa left her career as a teacher trainer when it started costing her $47,000/yr to work outside the home and now works from home as a social media consultant and freelance writer. She shares her full story and money saving tips here on her blog and as co-host of the weekly #cdnmoney twitter chat on Tuesdays from 7-8pm ET. Wife, and mother of 2, Christa lives in Rockland, Ontario and loves skating & nordic skiing on the Ottawa River. Posted on November 14, 2013, in Christa Clips, Couponing and tagged #cdnmoney Twitter Chat, Canadian Coupons, Christa Clips, Couponing in Canada. Bookmark the permalink. 23 Comments. So exited for this one…new hostess withe mostess on deck – Ms. Christa! *blush! Happy you can join us – it’s going to be a hoot! glad you can join us, Savanah! agreed! I’m looking forward to picking up some new tips & tricks, too! Thanks for reaching out … I’ll drop a line! yay! see you at 7! Looking forward to this evening’s #cdnmoney chat, see you there. great! this is going to be a fun one! super, thanks! It’s neat that we have some coupon prizes to share! So glad you can join us! We’re sure the tips, tricks & connections with other fab frugalistas will outweigh the overtime pay anyways! Be sure to introduce us to your community members if they’re tweeting at #cdnmoney, too – we’d love to say hi! I love COUPONS and PARTIES!!! we think it’s the perfect combination, too! Looking forward to chatting with everyone about coupons !! so glad you can join us, Elaine!